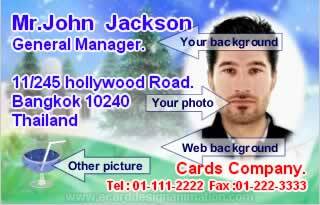 (make your own name card add photo business).Designing your business card with Name Card design Online is fast, easy.Name card program,Business cards,Business card design,Print business cards. Print Paper (A4 = 10 Cards). Now. Use your business card background. Click on the image. To design and print business cards. Edge of the business card can be made ​​to the rounded corners. Business cards are cards bearing business information about a company or individual. They are shared during formal introductions as a convenience and a memory aid. A business card typically includes the giver's name, company affiliation (usually with a logo) and contact information such as street addresses, telephone number(s), fax number, e-mail addresses and website. It can also include telex, bank account, tax code.